For those closely following the development of Sony's V-series Bravia, the moderately rated second-generation model comes at a time when its midrange counterparts are well ahead of the competition. Not that it was underperforming visually, but the issue has been that it lacks value-added functions and strong connectivity. This may have prompted the LCD TV advocate back to the drawing board. The new V300 range, Sony's third shot at this popular instalment, promises to address many of its predecessors' glaring shortfalls. The 2007 V-series has a no-nonsense design, shipped in matt-black finish and silver trimming. The quality plastic chassis is fronted by a slim bezel with integrated bottom speaker grille, relatively devoid of bling and clutter. Measuring 643mm high, it’s a tad shorter than some 40-inchers. This can be partly attributed to a factory-installed L-shaped pedestal stand. Visually, it appears to be fixed until a check reference to the user manual proves otherwise. 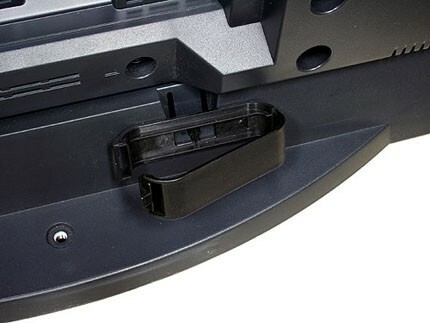 A modest two-way 15-degree swivel is available, thanks to a thin base plate underneath the stand. Alternatively, you could wall-mount the panel with a S$119 (US$78.01) (bundled or sold separately) bracket. But before you give the above a serious thought, do take into consideration the awkward TV controls' placement. 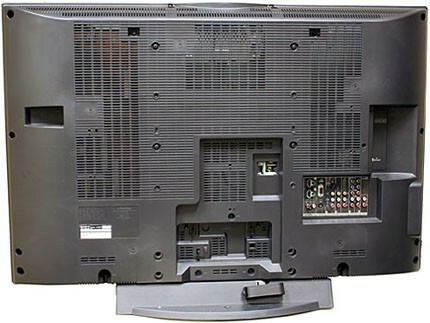 Unlike the left-sided A/V inputs, these are high up the set and may be difficult to reach and operate for the height-deprived. Nevertheless, for cable management, there are simple hooks and clips on the rear. The latter is lockable and wide enough to hold a handful of cores, effectively keeping the snaking wires tidy and out of sight. The 40V300A is bundled with matching basic remote. Unlike most of its peers, this offers only essential controls, trading simplicity for functionality. Though video selection here is performed by a less-than-ideal toggle key, impromptu adjustments are simplified with numerous shortcuts. Tool, for example, provides direct access to a collection of key functions otherwise deeply nested in the software menu. Another notable component is its five-way navigation key. This has nice tactile feedback and build good enough for heavy gaming. Faring better is its comprehensive yet structured software menu. We counted no less than 70 options covering a balanced mix of basic and advanced configurations. You will even have a hand in tweaking some of the Bravia Engine processing, too. These are favorably multileveled for a higher degree of customization. Having said that, it could have been better if there was a provision for primary color adjustment. The same went for the grayed-out Tint setting, hindering us from completing an indepth SpyderTV Pro video calibration. Encased within the well-ventilated shell is a 10-bit LCD panel rated with an HD-ready 1,366 x 768-pixel resolution. This boasts a 60 percent increase in dynamic contrast at 8,000:1 (2,000 for typical) over its V200 predecessor, while everything else stays status quo. Just for the record, that's 450cd/m2 for brightness, a fast 8ms response time and industrial-leading 178-degree viewing angle. Some of these figures are lower than their Korean equivalents but they are by no means shabby for current midrange entries. Wide color gamut backlighting system (WCG-CCFL) is nothing new for the V-series. But to further push the envelope, its engineers are pairing this hardware element with dynamic adjustments called Advanced Contrast Enhancer. Fancy name aside, this real-time software system analyzes onscreen video footage and automatically compensates backlight intensity for optimal contrast. This is one of its subsidiary functions under its Live Color Creation technology suite driven by the plain-vanilla flavor of the 2007 Bravia Engine video processor. Sony has doubled the number of HDMI terminals and updated them with the latest feature set. Now there is a pair of all-digital jacks on the rear with 1080p50/60-support for high-quality A/V interface. For added convenience, there is also the Bravia Theater Sync function, a proprietary flavor of the HDMI-CEC or Consumer Electronics Control. 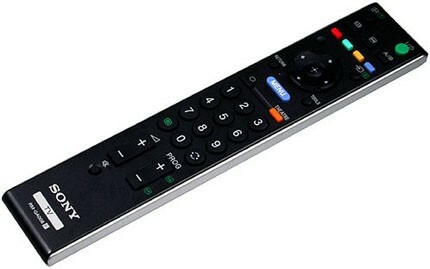 This allows users to operate their Sony home entertainment kit using just a single remote--think one-button powering up of your TV, disc player and sound system, for example. 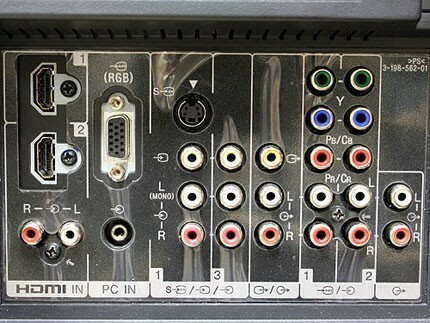 In addition to the above-mentioned, you will have access to dual sets of component-video sockets. These analog jacks have identical 1080p compatibility, which is a plus especially if you own the original Xbox 360. Now that computers are almost a commodity, PC input is not forgotten, too. 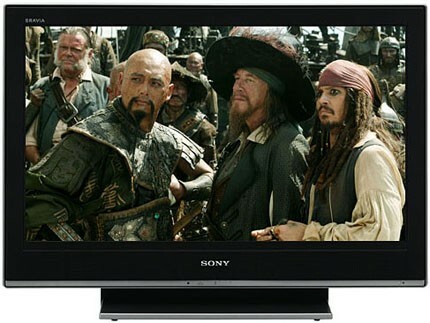 This has extensive resolution support including various widescreen format. 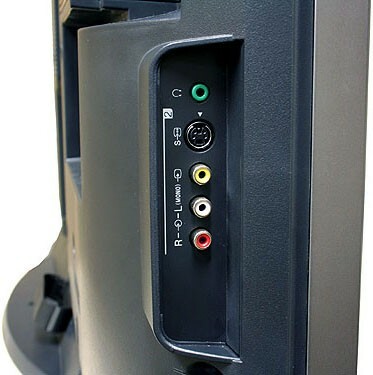 Covering the loose ends are legacy S-video and composite-A/V jacks, standard flair for older equipment such as non-HD settop boxes and VHS recorders. Getting the Bravia calibrated and up to speed was a simple affair due to omission of tint and grayscale tunings. Our choices of playback sources this time round was a Sony PlayStation 3 and Pioneer DV-S969AVi players, hooked up via quality Monster HDMI interconnects. First off, our weeks-long review was over-the-air broadcast reception evaluation. This turned out mostly a walk in the park for the V300, easily one of the better HD-ready panels with its clinically clean and sharp pictures. Distracting dot crawl was also relatively low here. It was another strong showing when it came to the synthetic Avia test patterns, shining through grayscale tracking with nothing less than perfection. Color decoding-wise, there was a slight dip in red but was still within reasonable tolerance in our humble opinion. We were supposed to give our new shiny HQV DVD a nice workout. Unfortunately all we got was an "unsupported signal" error message with the Pioneer running at 480i. Togging to 480p solved the problem and we were greeted with the same level of pristine visuals and minimal jaggies. Things just got simply better when we supplied even higher-quality video feed. In this case, a 1080p Blu-ray rendition of The Phantom of the Opera was faithfully rendered with minimal loss of details despite its modest resolution. And Live Color Creation did live up to its hype by putting out subtle gradations of hues, vibrant yet natural which also worked wonders for skin tones as well. We did, however, pick up strong vertical strobing in our HD-HQV film resolution loss test, suggesting a possible bug in its motion adaptive-processing algorithm. Now, before you jump into any premature conclusion, we were glad to report that the 40V300A had little problem handling fast-panning scenes in the video-based Ridge Racer 7. Switching over to another graphics-centric material, we supplied a 1,360 x 768-pixel signal through an HP 6910p laptop. As expected, PC text was razor-sharp at this near-native resolution, while image alignment was accurately formatted automatically. On the other hand, color banding was not an issue at all when we displayed our customary PC test pattern. We weren't bearing high hopes for the inbuilt speakers but these were surprisingly acceptable after a series of testing. There was a healthy dose of light bass matched by clear extended treble at reference level or 50 percent of its peak volume. We would suggest sticking with stereo sound as neither Stimulated Stereo nor S-Force delivered tangible spatial effects. At S$3,399 (US$2,236.84), the KLV-40V300A represents excellent value for its solid A/V performance, but it's a shame that aesthetics and feature sets are two stumbling blocks depriving it of an Editors' Choice award. Do you know what kind of mount I have to purchase for this sort of LCD?